Microsoft will have expected some users to find the transition from Windows 7 to Windows 8 challenging, but I doubt it was ready for the reaction from its own community that it is receiving for Windows 8 Consumer Preview. The best place to start is the comments on Building Windows blog here and here – at the time of writing, around 1300 comments, most from users who have downloaded and tried the Consumer Preview. It is worth browsing through them if this is something you care about; some are knee-jerk negative reactions, but some others are thoughtful and wanting Microsoft to succeed. Overall, the message is: don’t make us use Metro, let us stay in the desktop if we choose. I’m still waiting for an explanation as to why my 30" desktop screen has to look like a smartphone, that’s what my smartphone is for. My users range from tech savvy to plant workers and truck drivers. Like all of us, the start button is baked into our DNA … How can I make the desktop the default UI? I’m not going to deploy metro desktop to my users as the default screen. I would rather deploy a slew of ipads and I’m no ipad fan that is for sure. In 17 years of using Windows I have never used the Windows key. Interestingly I’ve never seen any user of a computer use the Windows key. I don’t want to learn and remember key combinations to do things that I can currently do trivially using the start menu. Let me tell you something, I always have a gazillion webbrowser instances and tabs open (rarely less than 50 browser tabs and as much as 100) – I often run 5-10 Visual Studio instances simultaneously (and I know your usage statistics says average is 1, so you won’t make it easier to distinguish between them, but this is a different matter..) – usually have 10+ explorer windows – and I absolutely love working this way, I am productive this way and that’s what counts for me. I run 2 big screens with 2560×1440 resolutions to give me as much working space as possible, so I can easily switch between a lot of my open applications, browser tabs and explorer windows. Even if I had a use for some Metro UI application, I would be looking for a desktop alternative, so I could have it running side-by-side with my other applications – let’s be honest, one application at a time might be great for the average joe, but it’s a horrible solution for professional users. Part of the problem here is that the Metro UI Windows 8 is more about solving a problem Microsoft has – how to compete with the iPad – than a problem its users face. It has been clear since Windows 8 was first previewed that the tablet UI and new Windows Runtime was Microsoft’s main focus, and that desktop users would get less value than they might normally expect from a major release. The reaction to the Consumer Preview though is more serious than that: many users are saying that Windows 8 is, for them, a substantial step backwards. I am writing this in Windows 8 on a desktop and it is not that bad. Apps are easy to launch once you get the hang of Windows Key – Search, and there are workarounds for the annoyances. There is no doubt though: if you are working mainly in the desktop – which is inevitable for most users upgrading – the “immersive UI” does get in the way at times. Since it must run full screen, a Metro app obliterates the taskbar and handy features like the time and date which shows bottom right in the notification area. If there were an option to run Metro apps in a window, I would grab it. The irony here is that the name “Windows” refers to the ability to run multiple apps in windows, as opposed to the single application UI offered by DOS. Another issue is that if you switch between Metro and Desktop, you have to learn two ways to do common tasks. For example, I tend to use the taskbar previews to find browser tabs, since if you have numerous tabs open it is the quickest way to find the one you want. If you are in the Metro browser though, you have to right-click to show the tabs. Right-click by mistake in the desktop browser, and you get a context menu. Add to favourites? Different. History? Different. All friction if you just want to get your work done. If you have multiple monitors, Microsoft’s “Move the mouse to the corner” idea for raising the Charms does not work well. The “Corner” is on the primary display, but if you have multiple displays it is not a corner but the border between two screens. You have to position the pointer just so to make it work. There is more; but it is not my intention to iterate through every annoyance. I am more interested in the reaction overall and in what Microsoft will do next. I will add that I admire what Microsoft has done from a technical standpoint in the Windows Runtime and that Windows 8 on a touch device with the right screen size has great promise as a new tablet operating system. It is my first choice for travelling; iPad and Android tablets are too limited, and I am more than ready to leave the bulky, awkward laptop at home. Needless to say, few of those commenting will have tried such a device, for reasons I have described before. Windows 8 in a virtual machine is a worst case, and it is a shame that so many (for good reasons) are trying it that way. 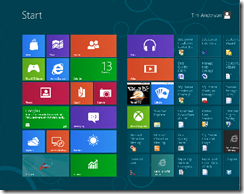 What next for Windows 8? It seems to me that Microsoft now has, broadly, three options for Windows 8. 1. Plough on regardless. This, I imagine, is the plan as it stands currently. Microsoft has deliberately made Metro unavoidable in Windows 8, I presume to ensure that it will not be ignored. There will be some refinements in the final release, improved discoverability of features users are struggling to find, but no fundamental change to the design approach. The plan as stated last month is that there will be no further beta, and the next public release will be the release candidate. The question: can Microsoft do enough tweaking to win over a majority of its own community? Right now my sense is probably not. A negative reaction on release will be costly for the company and for all those third-parties who depend on its platform; yes, Windows 7 will have a prolonged life, but there will be loss of momentum for the platform overall. 2. Delay Windows 8 for further refinement. Go through the reactions to this broad public beta test, and work out how to fix the issues without losing the vision behind this “reimagined” Windows. Delay would be painful, of course, but less bad than a failed release. The quick version of this would be to do what many are asking for: make the Metro-style personality in Windows 8 optional. Would that be such a disaster? 3. Release Windows on ARM (WOA) ahead of the full Windows 8. Most of the objections users have to Windows 8 do not apply to WOA, where Metro is primary, where all devices are touch tablets, and where those desktop applications (mainly Office) and utilities that are included are there to fill the gaps which Metro cannot yet fill. As for x86, users are still happy with Windows 7. When Vista was the current version, users could not wait for the next release, but there is no such pressure with Windows 7. I went to the Microsoft TechConference and heard a lot about Windows 8. There are some things I like and others, I don’t like. The very strange thing is: it seems that Microsoft tries to force users to use tablets. But in fact, users use tablets for fun and entertainment, maybe for document browsing in a train or plane, but obiously not at the office. Office work needs a good old desktop. Why should I buy a tablet for office work, when it means that I need to plug in an additional screen (since tablets are small mostly…), a mouse and a keyboard? o_O Hell yeah, I must abuse the tablet to be a desktop O_o Can anybody explain me the sense of that? Additionally, like 80% of the presentations @ Microsoft TechConference was about the Metro design. Everybody said “Metro uses the information as the key and blends everything else out”. Well, that phrase sounds nice. In fact, since Windows 8 seems to be a mobile operating system, that’s just the wrong way of thinking. Why do people buy Apple stuff? Very easy answer: Apple stuff is fancy, blinky, bubbly,… I think you know what I mean. In fact, I don’t like apple products, but I like their design and I think, most people really like their design. What does Microsoft do? Well, Windows 7 was kinda like trying to be fancy, blinky and bubbly too and after the first shock, I really enjoyed the way Microsoft went. But why is Windows 8 that extreme different to Windows 7? Actually, I don’t know anybody who doesn’t like the style of Windows 7…really, noone! Even the apple fanboys like the look of Windows 7. Metro style, in fact, looks like a mixture of DOS combined with advertisment bars. It’s nice that icons (tiles) are now more than just a “picture of the software”. I like the idea of getting the software data on the fly showed at the tile. But the way how it’s done is just horrible! Most people I know use their desktop very often and really like icons. So, let’s say I need to have 20-30 tiles on my screen (since I am a desktop user and don’t have a touch screen and obviously don’t like it to have “pages” for my tiles… I know, that’s a good concept for phones and tablets, but really not for desktops!). All of them change their pictures and/or data every…I don’t know…3 seconds, that means that the whole screen is changing all over the time, when I’m in the “tile-mode”. It’s just confusing, REALLY confusing. Most people don’t like websites which are overloaded with advertisment and Windows 8 Metro style just looks EXACTLY like that: An operation system overloaded with “advertisment”. In fact, it isn’t advertisment, but it really feels and looks like it. Conclusion: Microsoft says “Well, people like fancy, blinky, bubbly” operation system…uhm…ok, let’s just release an operation system which really doensn’t look fancy, blinky and bubbly at all. Let’s release an operation system which looks like a very, very ugly overloaded advertisment website, made in kinda DOS way! And I say: It doesn’t work like this! Since Vista, we know that users don’t use crap! I mean, it was possible to buy Windows XP a long time after the release of Windows Vista. Nobody liked Vista and I, as an oracle say, that nobody will like Windows 8 on desktop computers. Well well, I wrote a lot bad stuff. For the balance: I love the “search trough the applications” feature. That’s REALLY what I’ve been waiting for since a long, long time! So I can’t wait to see more of the new features. Last, but not least: Why the hell does the Registry still exist? Registry is crap! We know it since the beginning of Windows. Everybody knows that the Registry is crap, even Microsoft knows it. So, why is it still used in Windows 8? …crap…crap…crap! 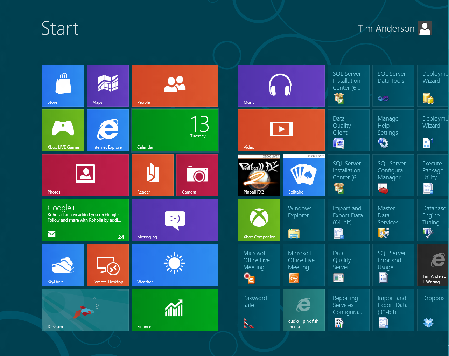 Windows 8 looks like Windows 3.1 with pretty square and rectangular icons. What a disaster for people all over the world who will have to stay in Windows 7 or SWITCH to another OS. Instead of Metro mode maybe it could be called Window 1 mode? It looks to me pretty much like a vending machine UI. I’ll stick to Windows 7. I saddens me to say, if Windows 8 will not include a normal desktop, windows 7 will be my last Microsoft desktop installation. (until windows 9 brings it back) I see window 8 as Millennium take 2. Like many others I know, I refuse to work from a tablet pc…. Not to mention the effort I have wasted learning to program, html5 desktop applications, *** Thanks Microsoft for screwing up an already bloated industry…. Here’s something I just thought of. Why couldn’t Microsoft have just developed a tablet O/S to compete with iOS and make it a separate product? Make it like the one they developed for the phone … so the two mobile systems can interact. Leave desktop Windows alone and continue to migrate it forward as a desktop system or (shudder) just incrementally update Windows 7 for awhile? As I said earlier, Microsoft could then have added a subsystem to Windows desktop that implements the Metro interface as an environment within Windows (on desktop machines). Developers could then develop Metro code on the desktop, test and deploy it to the tablet systems. I don’t know a LOT about OS/X and the Apple ecosystem (other than the fact that I have an iPhone 4S) however my observations tell me that OS/X is continuing to be the desktop environment for the Mac line of desktop/laptop systems whereas iOS is developed entirely for the iPhone/iPad. Surely to merge the two platforms into one O/S as Microsoft is doing is going to require a lot of compromises both on the part of the O/S itself and those who have to deal with it. I can’t believe Microsoft doesn’t have the resources to have developed a completely separate “mobile” division. I’m willing to bet that had they developed it separately like Apple’s system that the mobile O/S would be more seamless and of higher quality. In my use of Win8 so far I find that you’re constantly jumping back-and-forth between Metro and the “classic” desktop. I.E. if you run Task Manager then back to the desktop you go. The whole thing flows badly, IMHO. If the Metro version had simply been developed by itself completely separate from Windows with all it’s own native programs ALL running in Metro style I think there would be far less frustration about the whole thing. 2 separate product lines. I really think Microsoft may be biting off more than it can chew. Obviously I’m just one developer among thousands but this is the way I see it. Umm, the requirement of full-desktop experience is required for pros, no doubt. What about things like http://classicstartmenu.com/ installed on host Win8 machine by default (dev preview allowed this, but then unsurprisingly fight me with some preview license violence and replaced it itself back after while… ok, I dont want to be troll here just immediatelly, but in final version it would be allowed ….). BTW, I am using this classic menu even now on my primary Win7 box because it can return me even to Win2k/Xp menu style with added search, more configurations, its nice… AND, as Win8 has builtin virtualization, why not to run METRO apps (in fact screens, not windows:-) simply in virtualized window such way – for pros/devs for app development, testing etc. I hope building around such approach can work well. (Sure every really pro will use 64bit host with HUGE amount of RAM, not to mention that enhanced virtualization support will allow to conserve memory by sharing goods between many VMs with the same OS). In an ever faster changing world, the Metro UI will come and go like all other things. For Windows 8, this looks like it will be quicker than most. be a non starter for the Enterprise desktop. I used to laugh at the efforts of guys at UBUNTU. Nearly every release saw something that we had in windows being there in ubuntu. But the metro UI looks very very similar to UBUNTU. What have you done MICROSOFT.